FOUR PART FUGUE. Alex Vang, Dan Gary, Sean Hanson, and Ben Peterson of Orenda Fugue make time for music to contribute to the scene that inspired them. Eau Claire band Orenda Fugue will perform its new album, Revel, at a free show at the Mousetrap on Dec. 15. We’re Wolves will start the evening off around 9pm, followed with a performance by The Broken Eights. After these local bands show off some original tunes, Orenda Fugue will finally bring it. To put it perhaps too simply, Orenda Fugue is a rock band. However, when four people come together to create one project it’s hard to limit that range of influence and background to a single category. They cover a lot of ground musically, with their sound ranging from rock to alternative to progressive to experimental. “We don’t have free time, but we make time for this because we love it,” guitarist and vocalist Sean Hanson said. Orenda Fugue has performed locally and with “bigger-named bands” such as Sick Puppies and Devour the Day. They will open for Puddle of Mudd on Dec. 30 at The Metro. 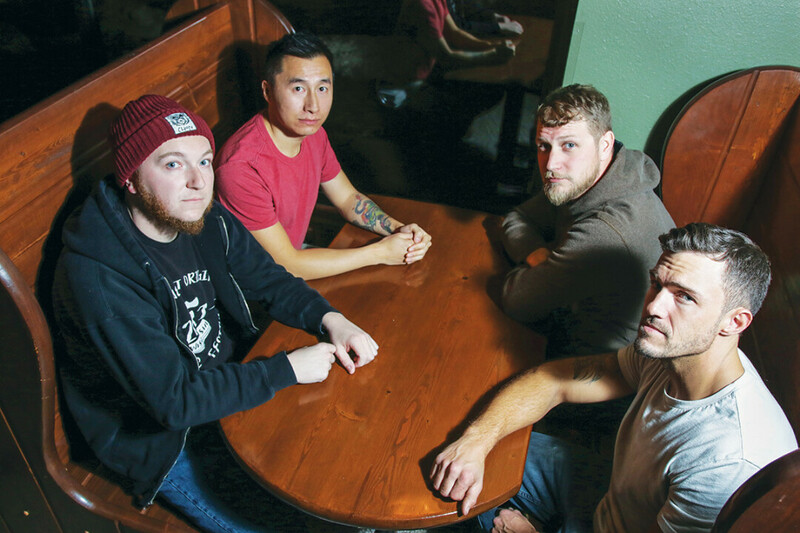 The four members of Orenda Fugue – Alex Vang, Dan Gary, Sean Hanson, and Ben Peterson – all agree that there is something to be said about the amount and quality of original music in the area, given how small Eau Claire really is. Growing up and seeing shows in the Valley has been a main motivating factor pushing Orenda Fugue to continue making and performing music. Having gone to high school in Eau Claire, all members of the band were impacted by local artists playing live shows, and now they express their gratitude for these experiences by performing for those same artists. While the local music scene is densely talented, the members of Orenda Fugue find it’s worth noting that bands are not competitive with one another, but incredibly supportive and understanding of the journey each group goes through to become “successful.” Orenda Fugue highlights the positive impact this cohesive attitude has towards music by finding opportunities to get to know and play with many local bands. Now, they are ready to fully thank the community on Dec. 15 in the form of music.